(a) Engage the splines of the input shaft and turbine runner. (b) Engage the splines of the stator shaft and the stator while turning the torque converter assembly. 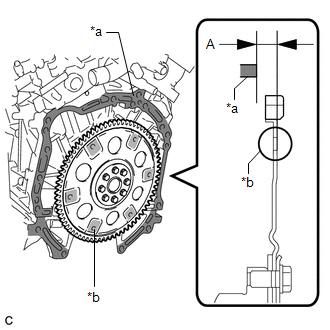 If the stator shaft splines are difficult to engage with the stator splines, move the torque converter assembly back approximately 10 mm and engage the splines while rotating the torque converter assembly. 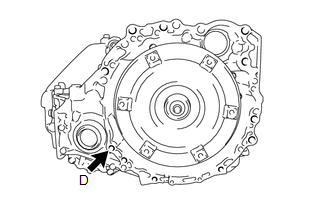 (c) Turn the torque converter assembly to engage the key of the oil pump drive gear into the slot on the torque converter assembly. 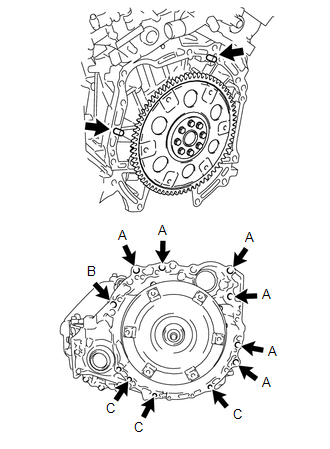 (d) Using a vernier caliper and straightedge, measure the dimension (A) between the automatic transaxle assembly contact surface of the engine assembly*a and the torque converter assembly contact surfaces of the drive plate*b. Make sure to deduct the thickness of the straightedge. 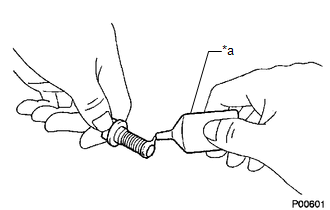 (e) Using a vernier caliper and straightedge, measure the dimension (B) shown in the illustration and check that the dimension (B) is more than the dimension (A), which was measured in the previous step. If the automatic transaxle assembly is installed to the engine assembly with the torque converter assembly not sufficiently inserted, the torque converter assembly may be damaged. If a U660E is used with a 2GR-FE, the standard installation depth is 14 mm (0.551 in.) or more. (a) Apply ATF to a new O-ring and install it to the speedometer driven hole (ATM) cover sub-assembly. (b) Install the speedometer driven hole (ATM) cover sub-assembly to the automatic transaxle assembly with the bolt. (a) Install the No. 1 transmission control cable bracket to the automatic transaxle assembly with the 2 bolts. (a) Install the 4 wire harness clamp brackets to the automatic transaxle assembly with the 4 bolts. (a) Install the front engine mounting bracket to the automatic transaxle assembly with the 3 bolts. (a) Set an engine lifter. Make sure that there is a clearance between the engine oil pan assembly and engine lifter. (a) Apply clutch spline grease to the circumference of the crankshaft contact surface of the torque converter assembly centerpiece. 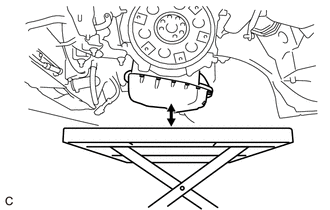 (b) While keeping the engine assembly and automatic transaxle assembly in a horizontal position, align the 2 knock pins with each hole on the automatic transaxle assembly and tighten the 10 bolts shown in the illustration. Confirm that the 2 knock pins are install to the automatic transaxle assembly contact surface of the engine cylinder block before installing the automatic transaxle assembly. Make sure that the contact surfaces of the engine assembly and automatic transaxle assembly are flat against each other before tightening the bolts. Do not use excessive force when installing the automatic transaxle assembly. Check that the torque converter assembly rotates. Make sure that the wire harness or other similar items are not pinched between the contact surfaces. In order to protect the automatic transaxle oil pan sub-assembly, place attachments on the transmission jack. 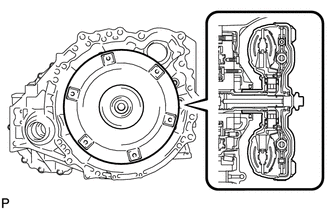 Make sure that the attachments and automatic transaxle oil pan sub-assembly are centered on the transmission jack. To prevent the automatic transaxle oil pan sub-assembly from being deformed, do not place any attachments under the automatic transaxle oil pan sub-assembly. Secure the automatic transaxle assembly to the transmission jack using a belt, etc. to prevent it from falling. 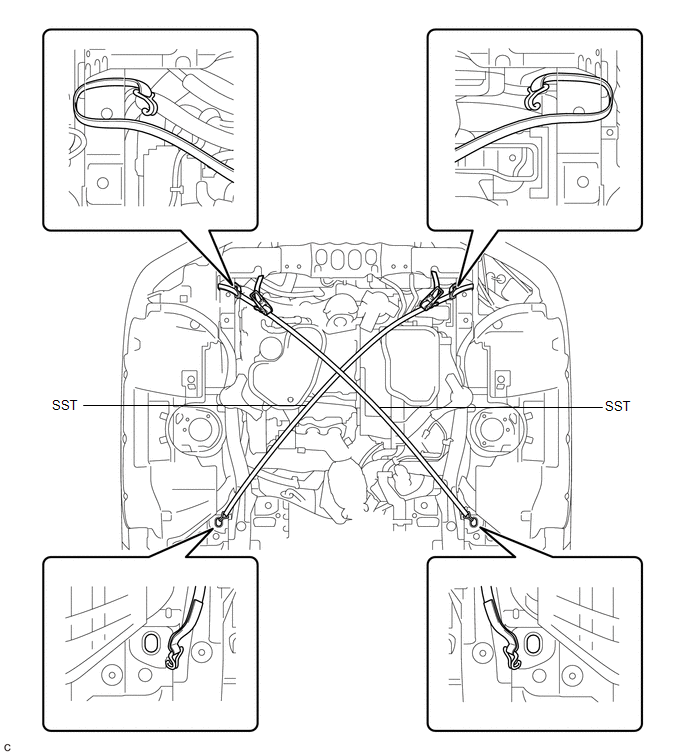 (a) Install SST to the vehicle body as shown in the illustration. 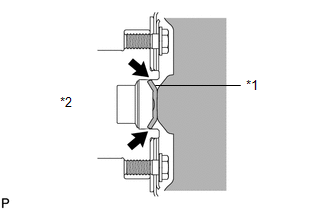 (b) Using the SST ratchet buckle, tighten the SST belt until there is no slack. (a) Connect the inlet No. 1 oil cooler hose and slide the clip to secure it. (a) Connect the outlet No. 1 oil cooler hose and slide the clip to secure it. (a) Install the engine mounting insulator LH to the automatic transaxle assembly with the nut. (a) Install the front engine mounting insulator assembly to the front engine mounting bracket with the bolt. (a) Remove the bolt from the engine mounting bracket RH. 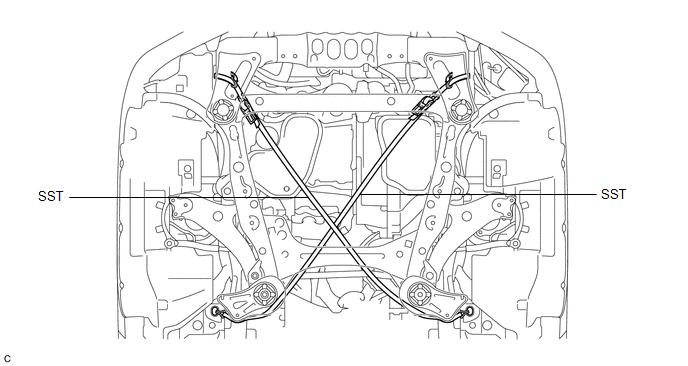 (b) Remove the 2 bolts and SST (support bar) from the vehicle body. (a) Install the engine mounting insulator RH to the engine mounting bracket RH with the nut. (a) Remove SST from the vehicle body. (b) Connect the windshield washer jar assembly to the vehicle body and tighten the nut. (c) Install the 2 bolts. Prevent SST from contacting the vehicle body or windshield. 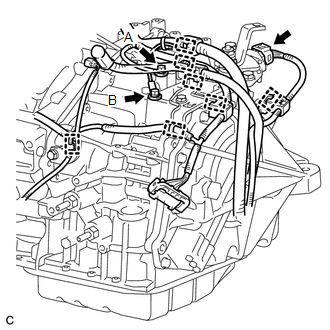 (b) Connect the engine wire to the engine assembly. 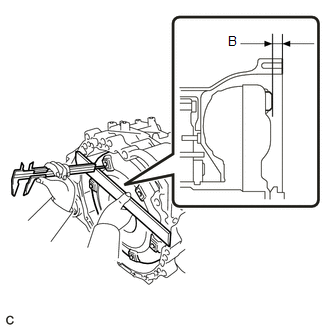 (c) Engage the clamp and install the nut and 3 bolts to the engine wire. (d) Connect the air conditioner tube and accessory assembly with the bolt. (e) Install the tank cap sub-assembly with the bolt. (a) Remove the 4 bolts and No. 1 and No. 2 engine hangers from the engine assembly. (a) Install the flexible hose bracket sub-assembly to the camshaft housing sub-assembly LH with the bolt. (b) Connect the No. 1 breather plug (ATM) to the flexible hose bracket sub-assembly. (a) Connect the clamp and connector. (b) Connect the 7 wire harness clamps and park/neutral position switch assembly connector. 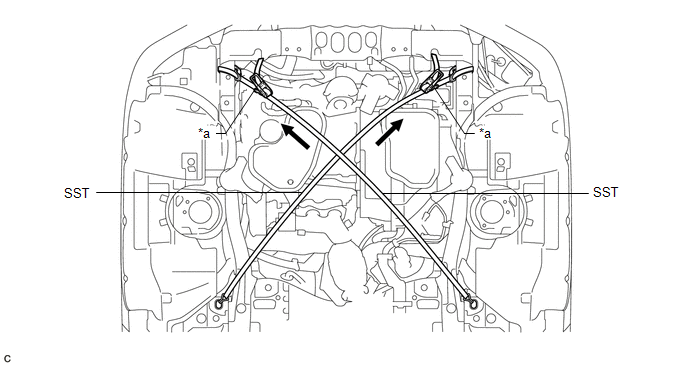 (c) Install the 2 wire harnesses to the automatic transaxle assembly with the 2 bolts.